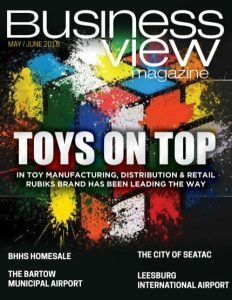 Business View Magazine interviews representatives from Gillespie & Powers, Inc, as part of our focus on suppliers of refractory products to the metal industry. 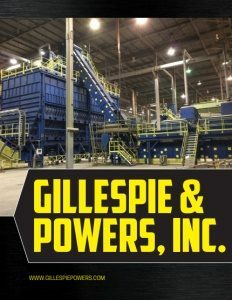 Gillespie & Powers of St. Louis, Missouri, designs, fabricates, installs, and maintains refractory-lined, high-temperature furnace equipment for the non-ferrous melting and hazardous waste industries. The family-owned company extends back to 1902, when Gillespie & Daly Construction, a brick and stone mason firm begun by John H. Gillespie, completed projects in the St. Louis area with bricks made from the area’s large, high-quality clay deposits. At that time, the company also supplied the fire clay bricks that were used to contain the coal-fired boilers that provided heat and energy. Certain clay products are known as “refractory” materials, meaning they remain chemically and physically stable at high temperatures; thus their use in furnaces, kilns, incinerators, and reactors. Over time, the company began to specialize in boilers and high-temperature applications, then ultimately grew into the engineering and construction of high temperature refractory furnaces and systems. Early in 1938, Charles A. Gillespie, son of John, H., united with Frank X. Powers to create Gillespie & Powers Inc. At that time, the city of St. Louis banned the burning of soft coal, which necessitated the conversion of boilers to use either gas or oil. So, the company designed the refractories that could do that, and, for many years, it continued to provide masonry installation services for heating systems and electric generator stations. 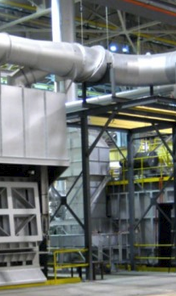 It was in the 1960s that, as a result of providing refractory repair services to a number of aluminum clients, the company expanded into the aluminum industry, beginning with refractory rebuilding services and culminating in the design, fabrication, and installation of aluminum melting and holding furnaces. The company’s management was also transferred to the third generation – John R. Gillespie, nephew of Charles A., was named president of the company in 1966, and in 1968, Charles K. Gillespie, son of Charles A., came on board as a partner and vice president. From that time, the two managed the company through more stages of growth and prosperity. Another generation, the fourth, took its place in the mid-2000s, after John R. died and Charles K. retired. Jon R. Gillespie, the son of John R., who joined the company in 1980 as a brick mason after receiving his degree in mechanical engineering from St. Louis University, was named president. Today, Gillespie & Powers is run by Jack B. Gillespie, son of Jon R., and his cousin, John Peterman, who bought the company from Jack’s dad, in September 2017. Today, Gillespie & Powers has about 75 employees, including engineers, field supervisors, and office support. Its head office remains in St. Louis where it maintains its refractory masonry construction activities, as well as the aluminum industry segment, including the design and installation of melting and scrap preparation equipment. In addition, the company has masonry construction field offices in Hannibal, Missouri; Lewisport, Kentucky; Davenport, Iowa; and, most recently, Muscle Shoals, Alabama. Check out this handpicked feature on RE/MAX Select Realty – A culture of caring. WHO: Gillespie & Powers, Inc.